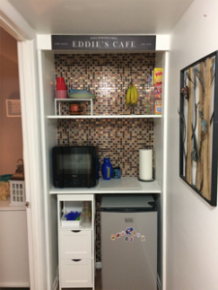 Impact on the People we Support – Eddie’s Cafe | Service Coordination, Inc.
behaviors his entire life. Eddie has been receiving support services from Providence Center Inc. for the past 13 years and the past three years that he has been in Community Learning Service have made quite an impact on his life. He has been working with his parents and provider for several years and he has lost over 100 lbs! Eddie began to take control of his health by simplifying his dietary choices through Nutrisystem. When Eddie would engage in community activities with his group, he would pack his own lunch to ensure he stayed on track. This past year, he decided that he wanted to embrace his new lifestyle, by learning to prepare his own healthy meals. Eddie began working with his Providence Center Inc. team each week through an interactive cooking class. Eddie has been able to take the skills he learned in class and he has applied them to his meal preparation at home and his job too! He has been working at his local Hardee’s for a few years, and recently he was able to prepare meals for customers without any assistance! This was a new experience for Eddie and he hopes to gain increased exposure as the newest kitchen staff. Eddie and his team are overjoyed with the progress he has made this past year. Eddie is hoping he can build upon his skills, so he can move out on his own! The team is working towards Eddie moving out of his parents and his parents are trying their best to guide Eddie prior to his residential resource search. It seems as though this most recent update is another positive installment in Eddie’s wonderful future.